Consider Invisalign treatment to get the beautiful straight teeth you've always wanted — without braces. 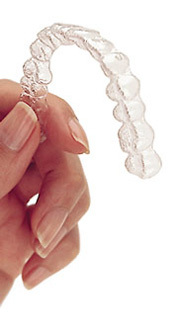 A consultation with Dr. Trentini can determine if Invisalign clear aligners are right for you. Not only are the aligners virtually invisible, they are removable, so you can eat and drink what you want while in treatment. Plus, brushing and flossing are no problem. Without the brackets and wires, Invisalign aligners are also more comfortable than braces. You wear each set of aligners for 1-2 weeks, removing them only to eat, drink, brush, and floss. As you replace each aligner with the next in the series, your teeth will move — little by little, week by week — until they have straightened to their final positions. You'll visit us about every 6-8 weeks to ensure that your treatment is progressing as planned. Appointments are typically less frequent, while the overall treatment time is similar to, or even less than braces. It is true that general dentists can be certified to provide orthodontic treatment with Invisalign. However, dentists lack the training, expertise, and experience that you will find with an orthodontic specialist. Why Invisalign clear aligners over metal braces?